The sound holes on violins, violas and cellos aren't there just to be gorgeous; they serve a vital function in the sound of the instrument. 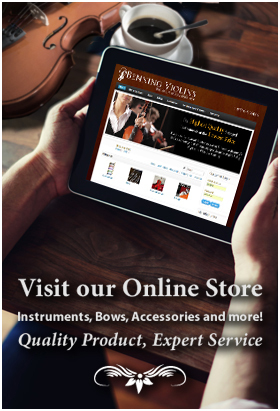 The sound holes of stringed instruments such as fine cellos, violas and violins, also known as F-holes, are openings in the top plate. The holes allow the plate to resonate more freely and let internal air resonance to travel outside the instruments, enhancing their lower pitches. In box resonating musical instruments, sound holes come in other shapes, like the O-opening in the guitar. After the thickness and contours of the top plate are finished, the violinmaker is ready to carve sound holes into the plate. A template is made of thin plywood in the shape of a desired design, wide enough to push a sound post through. It is placed on the plate accurately keeping in mind the length of strings. The end of the F-holes should also lead to where the bridge should be placed. Then, the template is traced with a pencil. Different sized instruments require their own template. Cellos require a larger template than violas do, and violas require a larger template than violins. The next step is to flute, or make grooves, at the edge of the sound hole using a gouge, and then finished with a steel scraper. The grooving effect is purely decorative. Using a scriber, the two end holes are marked for the drill, and then punctured with a hand drill. They are cut larger, first on the outside of the plate, and then the inside, to avoid splitting wood. 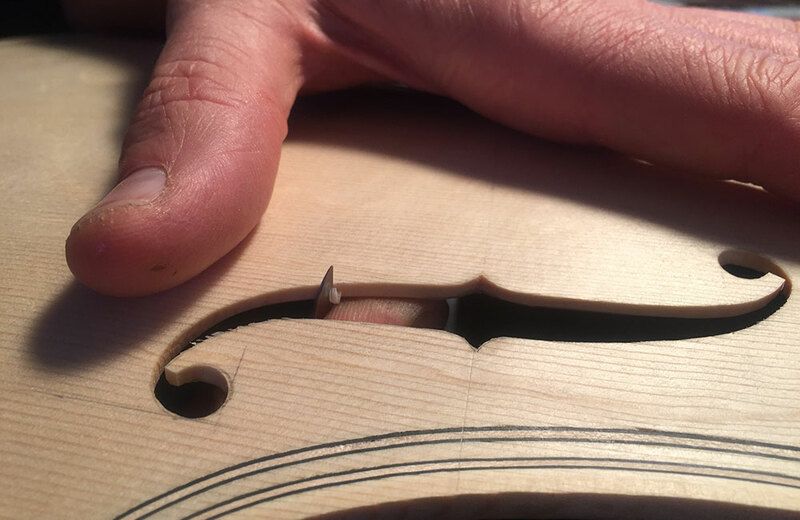 The trickiest step for the violinmaker is to saw out the F-hole while avoiding splintering wood and damaging the top plate, so precautions must be taken to follow the grains of the wood. The purpose is to remove the inner wood, and the saw should stay well within the previous line, as precise edges can be worked on later. Next, a knife is used to pare away waste wood and, through cutting a complex series of curves, achieve the final cut of the F-hole design on the instrument.